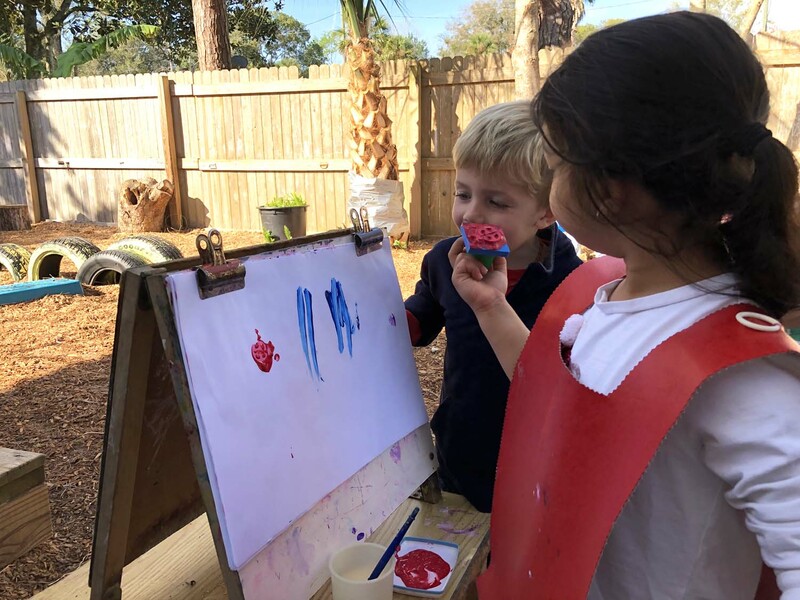 The toddlers in Ms. Sara’s class are using red and blue paint to make purple, and they can use the ladybug stamp in their art. As we move along in the school year, there are more opportunities for children to take a leadership role. This could be teacher-initiated, or we might suggest the child look around to see if a classmate is available. It’s usually thought that the older children are the leaders, but sometimes a younger child is right there to lend a helping hand. This is a way to encourage problem-solving, helping each other and bringing the class together as more of a team. We began the month with hearts, love and valentines, and now we’ve transitioned to ladybugs. Hearts are everywhere! There are heart magnets in a basket to put on and/or take off the refrigerator. Heart-shape Valentine’s notes fit perfectly into the opening of a tiny mailbox. It’s fun to read the message and let the children decide who they’d like to send a valentine to as they slip each one into the mailbox! To improve fine motor skills, a child can choose the pom-pom transfer work. The pom-poms are in a small closed box, and tongs are available to pick them out of the box and place into the heart molds of an ice cube tray, one at a time. The art shelf has a heart stencil with paint. This takes a little direction and coordination, but it has proved satisfying to those interested children as they pick up their paper and see a heart, or close to it. They also could glue small hearts onto a wreath design or a doily, one with liquid glue and the other a glue stick. We offered a sandpaper heart rubbing for the children to rub a crayon on their paper and see if they start to see the shape coming through. After Valentine’s Day, we bring in lots of ladybugs. There are small ladybug bean bags on the sensorial shelf. We have plastic eggs that look like ladybugs to open and see what’s inside. They can paint the shape of a ladybug or glue black spots on a ladybug cutout in the art area. The ladybug life cycle (eggs, larva, chrysalis and adult ladybug) is available to inspect, match object to picture and discuss. 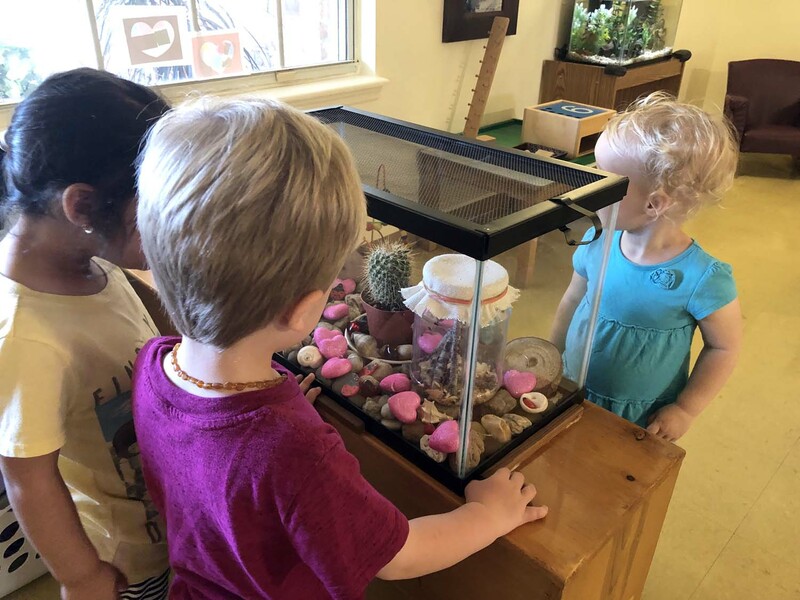 All of these are even more exciting because the activities can be compared with the live ladybugs we have in the classroom for the children to observe! The toddlers have been learning about ladybugs and observing real ladybugs in their classrooms during February. Red, pink, white and purple are used to go along with these themes while the color of the month is purple. There is a soft and fluffy purple sensory bag containing items of various shades of purple, including the translucent eye cover that makes everything look purple. The dough on the art shelf to be molded, rolled and shaped with a heart-shape cookie cutter is purple this month. We have been painting with all of these colors separately, as well as white and red to make pink and red and blue to make purple. The colored-water mixing work is always popular, and it now contains blue water in one little jar and red in the other. The dropper allows for small amounts to be added, and then the children watch the shade slowly change. There is a bucket nearby to pour the mixed water and small towels right there for possible spills. Since repetition is important in the learning process, I love seeing a child interested in doing a work over and over. This is one of the works that is rarely done only once. Being the sixth full month of the school year, the number six is in the drop box, as well as the peg work on the pre-math shelf. you give it away, you give it away. you end up having more! Will you be my valentine, my valentine, my valentine? Will you be my valentine, and hold my big red heart. I will be your valentine, your valentine, your valentine. I will be your valentine, and hold your big red heart! Love somebody… Yes I do! Love somebody… But I won't say who. Love somebody… I love you, you, you! friend of mine, friend of mine. Skidamarink kadink kadink, skidamarink adoo…. I love you…. I love you in the evening and underneath the moon! You have red wings and black dots. Ladybug your spots are swell. Crawled up my arm… . And then it flew away!